Looking for the best ways to publicize your content? Want more social exposure from the get-go? Sharing on a variety of social media platforms in different ways helps you engage with a variety of audiences. In this article I’ll share posting guidelines you can use to promote your content for the first 24 hours after it goes live. 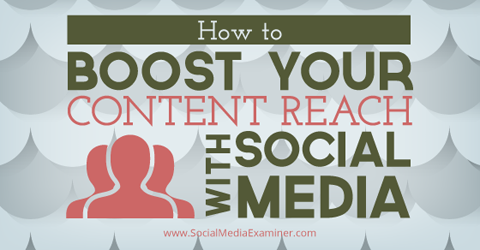 Find ways to boost your content reach with social media. Whether you publish a new blog post, video clip, audio interview or other piece of content, you want to spread the word to your followers as fast and efficiently as possible. While the exact tactics may vary from business to business, the basics for each network remain the same. First 24 hours: Share the content to Facebook once. Keep the following guidelines in mind for posting to Facebook. Try not to post new content more than two or three times in the first week after it goes live. Post new content once on Facebook in the first 24 hours. To occasionally amp up your visibility, ask your team members and friends to share your business page updates to their personal accounts. This helps broaden your reach and get your updates in front of people who aren’t already following the company Facebook page. First 24 hours: Share the content three or four times on Twitter. Keep the following Twitter guidelines in mind. Use different copy, hashtags and mentions in each update. Don’t just repeat the same message. Change it to see what engages your Twitter followers most. It’s okay to retweet other people who share your posts, but don’t just leave it at that. Take these opportunities to try to get a conversation going. Also, be aware that you don’t completely fill up your feed with retweets and replies. Alexandra Skey of Spokal estimates that a new tweet only has a lifespan of about two hours, which means followers who don’t check their feed regularly are likely to miss your updates. Social Media Examiner adds a hashtag to their article tweets the second time they’re shared in 24 hours. First 24 hours: Pin all blog post images to Pinterest or Instagram. Post to Pinterest if your audience tends to be middle-aged or older. 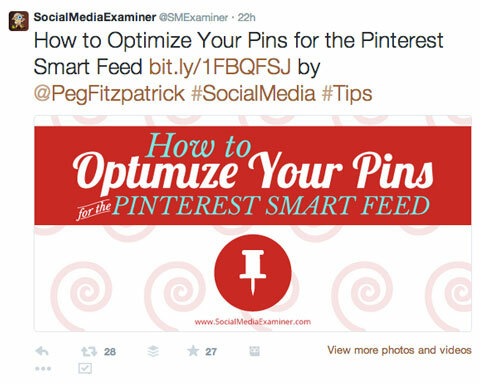 Social Media Examiner pins their articles to special subject boards. Post a number of notable images from a behind-the-scenes, how-to or regular article with your audience. Other options: Turn inspirational quotes from the article intoimages or share content in other formats to Pinterest and Instagram. First 24 hours: Post content link to profile or long-form blog post. LinkedIn offers the opportunity to share either short updates in the form of links to content (that you can also tweet) or long-form blog posts in their entirety throughLinkedIn Publisher. 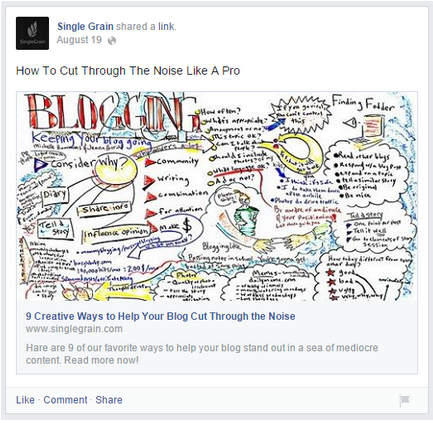 Single Grain shares links long-form blog posts on LinkedIn. Decide how to post on LinkedIn on a case-by-case basis and determine who will post it. Rotating posting duties among senior staff members helps keep things fresh for your readers and lets you reach a wider audience. First 24 hours: Post content link to company profile and/or Google+ communities. One of the nice things about Google+ is that the network allows users to post long updates. Therefore, you can either share the full blog post to your company profile or draft a custom long intro and then link back to the newly released piece of content. 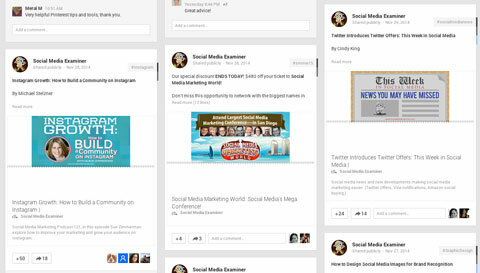 Social Media Examiner posts articles to Google+ in the first 24 hours. Depending on the quality of the content, you may also want to post it to your Google+ communities. Generally, though, you’ll only want do this with your highest-quality pieces or with those that you know will perform well with that specific audience. All social media marketing plans are a little different, so use logic to adjust the guidelines according to your own needs. Trial and error also works wonders to determine what’s successful when promoting new content. Develop a social posting plan to get your content the attention it deserves in the first 24 hours after it’s published.